2.Bodicea 7.How Can I Keep From Singing? Considered a Collector's Edition. This set contains the Shepherd Moons album on CD and the Moonshadows video on a VHS cassette in a presentation box. A two CD set containing the Watermark and Shepherd Moons albums and their booklets. This collection is a three CD set of the Celts, Watermark, and Shepherd Moons albums in a presentation box complete with a book containing a biography of Enya's career, a discography, and various pictures. The Shepherd Moons disc has the original version of "Book of Days." A promo-only album released to celebrate the 10th. 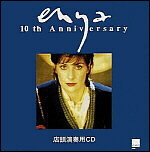 anniversary of Enya's debut album, Enya. Why the tracks are repeated is unknown. Only 100 copies were pressed, so this one is very rare. 09/08/99: Special thanks to Blake Miller for e-mailing me and informing me that the songs may likely be repeated so as to present them in both their original language (Gaelic, Latin, etc.,) as well as in English..